If you want to expand your walks outside of EE, click here to see some area hikes. The Walking Trail around EE is a 1-1/2 mile long marked trail that takes you through many parts of our neighborhood. The trail description below starts and ends at the pool & spa, Sunset Ramada and garden, all at 763 Calle del Ensalmo. The trail is marked in the sketch above as a series of footsteps. In the years since 2002 when the sketch was created by Al Larson, a number of things have changed, including the addition of the Ramada which replaced the Shuffleboard courts in 2007, and the addition of restrooms in 2012 at the Tennis (since 2008, Pickleball) Courts at the West end of Circulo del Sur. Many of those changes are noted in a newer map of the trail, created in 2012, which also includes a reference to the public art on display in Esperanza Park which was created to commemorate the centennial of Arizona's admission as a state on February 14, 1912. Our newest park, Wild Flower Park, is indicated on the new sketch as well. Click here to open a printable (PDF-format) copy of the map above to carry with you. The trail starts across Portillo from the Sunset Ramada & Garden. and pass by a group of Pineapple Palms on your right. ...passing a variety of native species -- mesquite, prickly pear, etc. Continue along the common driveway to get to Holgado. Cross Holgado to the entrance to Mesquite Park, marked by a small bridge. Continue through the shade of Mesquite Park along the path bordered by stones. The path crosses another small bridge, then continues on. that is landscaped with Pineapple Palms and ground-cover. ...to arrive at the pickleball courts, bordered all around by tall Oleanders. turn left and follow the trail to the East, with a mountain view. A bench near the trail provides a place to pause and enjoy the mountain views. The trail continues along the arroyo after crossing Camino Holgado. The arroyo was improved by the addition of taller walls after the Flood of '83. Continue to the break in the wall on Vereda Calma, almost to Portillo. Cross over Portillo at the bridge, then follow the arroyo Eastward. 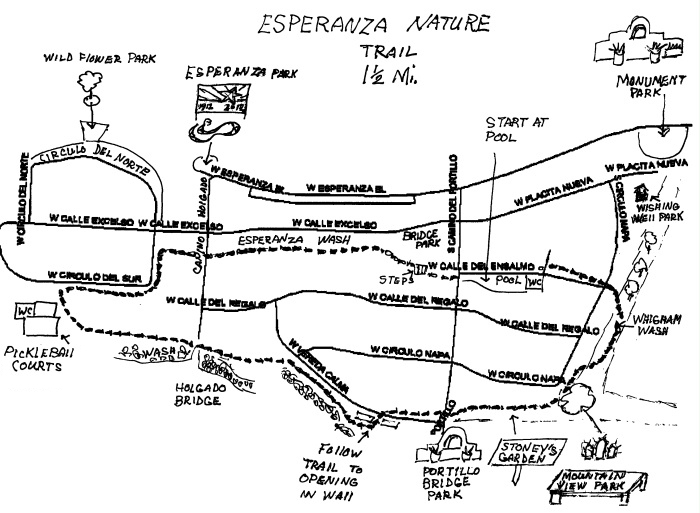 The trail turns left to follow the Eastern boundary of Esperanza Estates. Continue Northeasterly until you come to Whigham Park, split by Whigham Wash.
to follow Calle del Ensalmo back toward its starting point. Continue up Ensalmo to the pool, Sunset Ramada & garden. Done! Or, when done viewing: click here.